I do like to cook our vegan family meals from scratch. Not only are they fresh, tasty and super healthy but I can save a lot of money this way. I’ll often used dried herbs but I really do like using fresh as the recipe tastes so much better with them and lots of herbs are really good for you too. Like parsley, packed with the nutrients Vitamin A, K, C and E plus folate and iron and more! My favourite herbs in the kitchen at the moment are parsley, coriander, chives and basil. I love using bucket loads of fresh parsley chopped up in salads all year round or in veggie soup or a parsley sauce with a fish-less steak, or battered tofu. My other half makes THE most amazing vegan curry with fresh coriander which smells incredible. I also adore the aroma of basil and I’m really into making (and eating!) thin and crispy homemade vegan pizzas right now – simply using vegan mozzarella and a scattering of basil leaves, and a drizzle of olive oil just before serving. Sometimes less really is much more! With supermarket herbs costing around 70p a packet, one way to be super savvy is to grow your own. All you’re going to need is some compost and herb seeds, which you can pick up really cheap in most supermarkets now. I planted parsley and chives (pictured above) in these silver planters this morning but I often just use various food containers to plant in – like hummus or mushroom tubs. 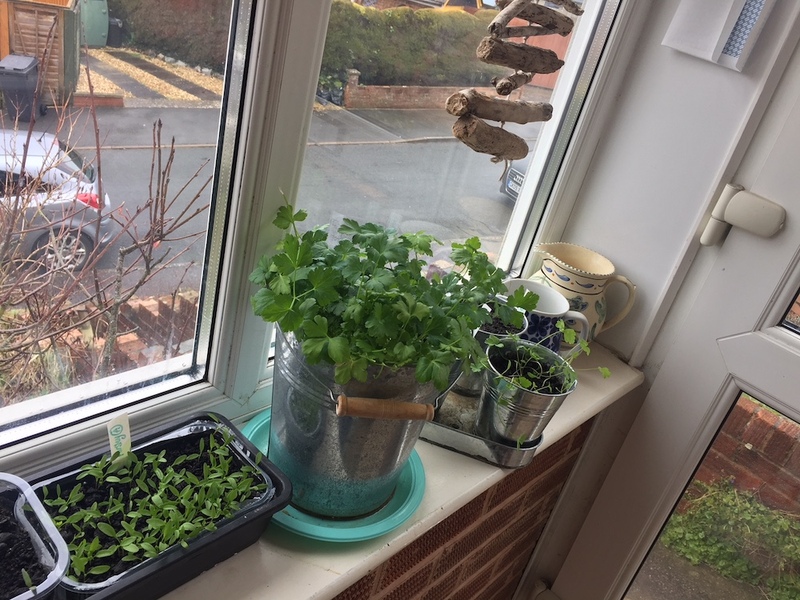 You don’t need a greenhouse or anything fancy or expensive, I have a couple of windowsills (pic below) that really catch the sun so I line up my pots on there. I also try and plant up a pot of the herbs I use the most every couple of weeks to replace that packet of herbs I’d buy at the shops. Top Tip: Use old margarine tub lids for recycled homemade plant labels. Just chop them up into strips and write on with a marker pen. 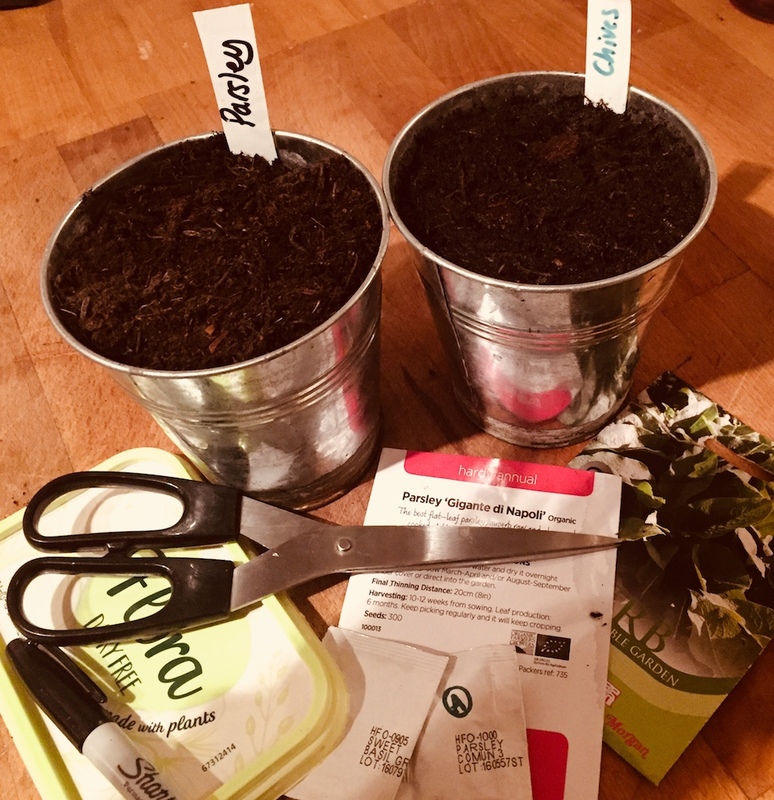 Have fun planting and growing your own and saving some cash along the way and don’t forget to add a comment and let us know how you get on. You can also subscribe to my newsletter to be the first to know about new ways to save and make more cash on a plant-based diet.